The ACES modeller in question is Kevin “Gibbage” Miller, assisted in this case by Chuck Jhodry (“Simulator Integration”) and Bernt Stolle (Flight modelling). 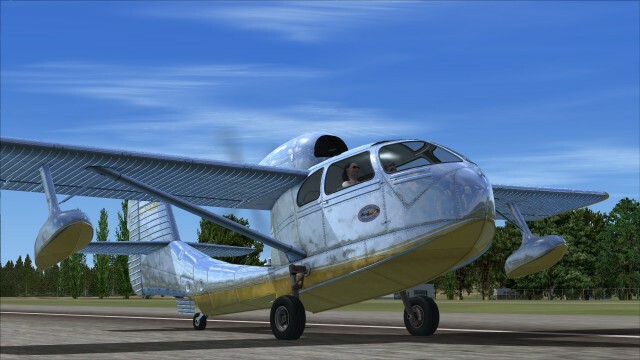 The result is a little four seat amphibian from the 1940s, designed to be flown by anyone – as many aircraft were back then. 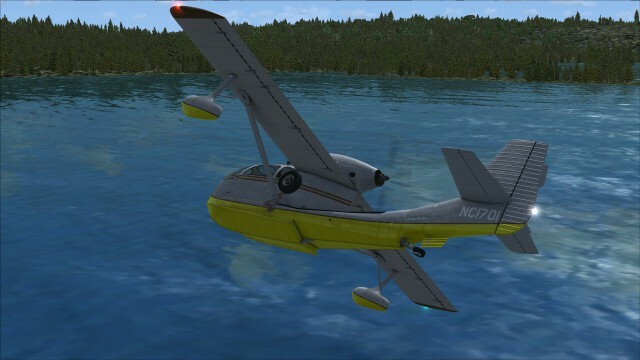 As a result, the Seabee is a very simple aircraft and this simulated version reflects that. You won’t be finding a full IFR nav set here, no second altimeter for airways, indeed no attitude indicator or vertical speed indicator. This is the Icon A4 of its day, but that doesn’t mean it isn’t fun. The version being tested here is the FSX Steam Edition DLC pack, which has a number of minor differences compared to the “non Steam” edition available, published by Aerosoft. The most obvious one of these differences is the installation method; when installing Steam DLC, you simply purchase the add-on and it installs automatically, as an update to your FSX if already installed. 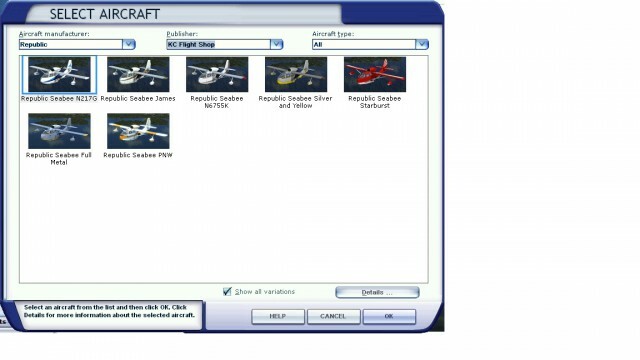 The Aerosoft published edition uses the standard Aerosoft installation technique, whereby you are provided with a download and a key at purchase time, then when running the installer have to insert your e-mail address and key to install. Once installed, the package takes up a little under 360MB of hard drive space. Uninstallation is carried out via the control panel/add or remove programs, as is normal, for the Aerosoft version, while SE requires right clicking on the FSX entry in your Steam games list, selecting “Properties”, “DLC”, then unticking the “Install” checkbox. Three documents are provided with the package, all in Adobe PDF format; “Parts Catalog”, “Seabee Checklist” and “Seabee Owners Manual”. Of these, the first is a 27-page document, detailing every major component that makes up the aircraft, but is really only of background interest only as it has no effect on your operations inside the sim. 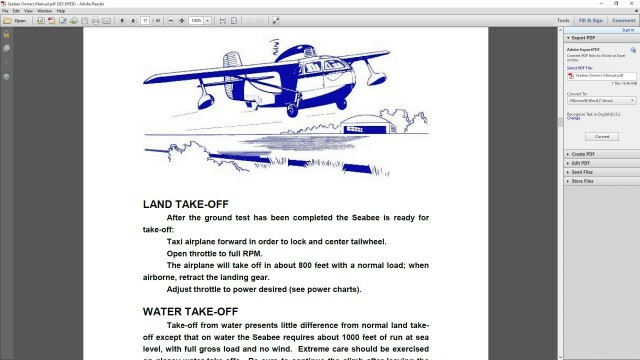 The checklist is a single page, recreating the 1946 Seabee checklist and is a really useful quick guide to operating the aircraft, while the main document is the 60-page “Owners Manual”. 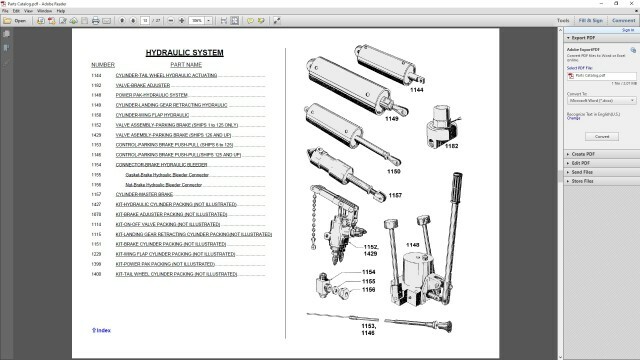 The Owners Manual opens to show three pages detailing the clickable areas and locations of equipment in the VC, while the remaining 57 pages are a direct copy of a 1947 aircraft manual and, as such, includes a number of features not included (or included, which would have been options) with the simulated model. The manuals are, in general well presented and usable, although there are a few text errors and the Apostrophe Police would have a field day in places. The external model of the Seabee is extremely nice. Deceptively simple, but intentionally so, because this is a very clean and comparatively simple aircraft. The reason I say deceptively is that there are very few surfaces on the Seabee that aren’t curved in some way and curves are extremely difficult to model well without a massive poly count. It’s absolutely right here, with smooth curves visible everywhere, yet the model and its textures have been set up in a way that I have seen no performance hit at all. 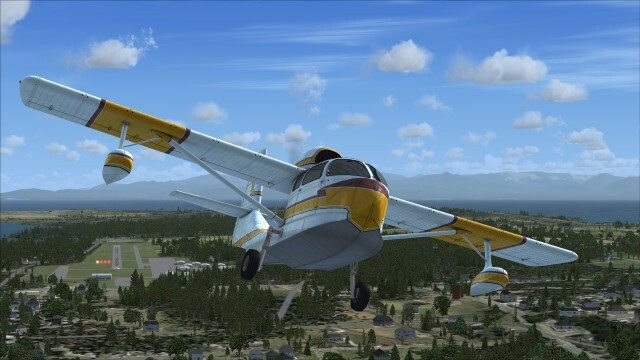 There are seven repaints included in the package, all representing civilian aircraft, although the “Harbour Air” variant in the Aerosoft published package has all the identification removed in the Steam DLC package and is renamed “PNW”. This is almost certainly because of Dovetail Games’ policy regarding licensing from trademark owners, so isn’t surprising. All the liveries are well presented, although I personally feel that the baked reflections on the metallic textures of N87545 and the overall level of reflection on C-FILM are a touch overdone. On the other hand, the high reflection finish seems to work nicely on “Starburst”. C-FILM and Starburst, however, do show off the very well done bump map brilliantly! To top the lot off, there are animations such as the visible spinning engine components and vibrating exhausts, which again are very well done. Your passenger moves slightly as well, although not much, and both pilot and passenger face into turns. 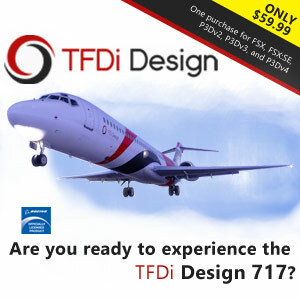 In general, I think the external modelling of the aircraft is pretty much spot on – the choice between modelling and texturing of external components is good, animations are smooth, FSX’s graphical capabilities are used well. I really like this model. 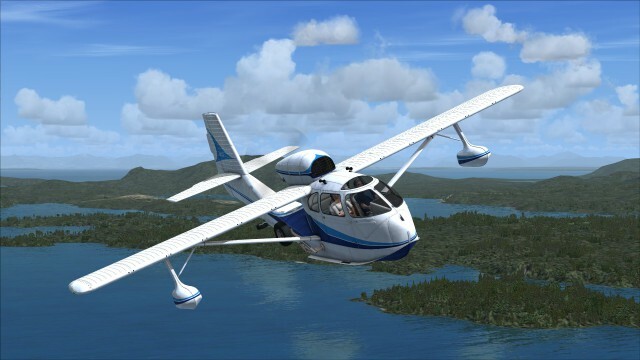 As simple as it is, this aircraft is designed to be flown entirely from the virtual cockpit, with the only 2d panel available being the default GPS500 on the shift-1 pop-up. The VC is very nicely presented and includes that rare bit of company, in the form of a young lady sitting in the right-hand seat. Her right arm sits clear from her stomach, which looks a little contrived and she has some issues with model clipping, but that’s a bit nit-picky. She’ll also go away with a click in the correct place on her seat, if you prefer. Texturing is very good, with no obvious stretched textures, or anything simply coloured rather than mapped and textured. The half-width panel (I’ll come to why, shortly) contains no default gauges at all – everything is custom to fit the aircraft, a couple of which can be found by looking up. Like many 1940s to 1960s aircraft, the trim is on the cabin ceiling – joined, in this instance, by a propeller pitch reverser, which is a little unusual and again something I’ll come back to. Weathering is really nicely done and bump maps are once more used to very good effect. 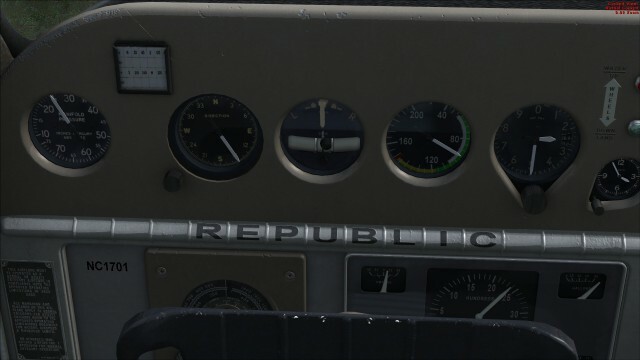 The only thing that stands out a little is the “N” number, which changes with the registration of your aircraft and as such is a decal, rather than textured, so does look different, but not distractingly so. This is also common to almost every FS aircraft that has a variable registration, so perfectly reasonable. The one big problem that I have noticed with the interior model is that I read the manual. I can hear everyone go “huh?” from here at that point, but one statement made in the manual is that the design philosophy for the aircraft is that “all knobs are forward against the panel for takeoff“… Which means that the throttle, mixture and pitch controls in the VC are animated in reverse – they are “out” for maximum and “in” for minimum – which is the opposite way round to the “all forward for takeoff” design discussed in the manual. That’s actually quite a major bug, so I’m surprised that no-one has picked it up or fixed it. The pilot’s yoke can be removed/replaced by clicking on the central section of the yoke “Y”, to give access to the full instrument panel, and the co-pilot/passenger yoke can be removed/replaced by clicking the knob on the face of the “Y”, opposite the main shaft. Additionally, three more internal views are provided, for passenger/co-pilot view, between-seat controls for flaps and wheels, plus finally the radio/switches. These are cycled as usual, using “A”. 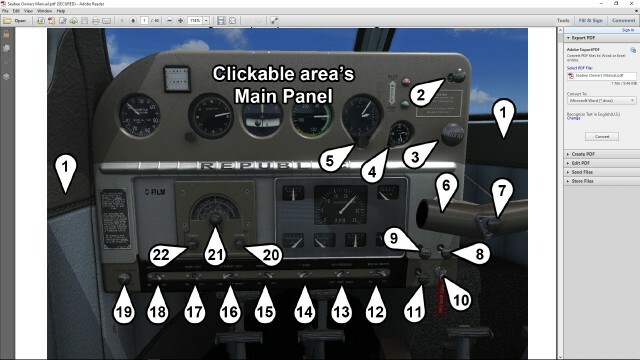 The 2d panel view provides a clear, uninterrupted, view forwards from the cockpit. As with the external model, I really like the presentation of the internal model. While I am quite disappointed with the obviously inverted control animations, the clipping on the passenger model is only really noticable if you look specifically for it and I have no other complaints at all. 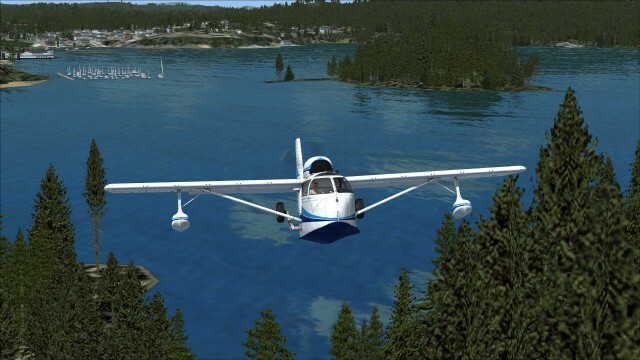 Flying the Seabee is intended to be simple. It’s an “everybody” aircraft, from that post-WW2 period when aviation was intended to be available to everyone, thus as simple as possible. 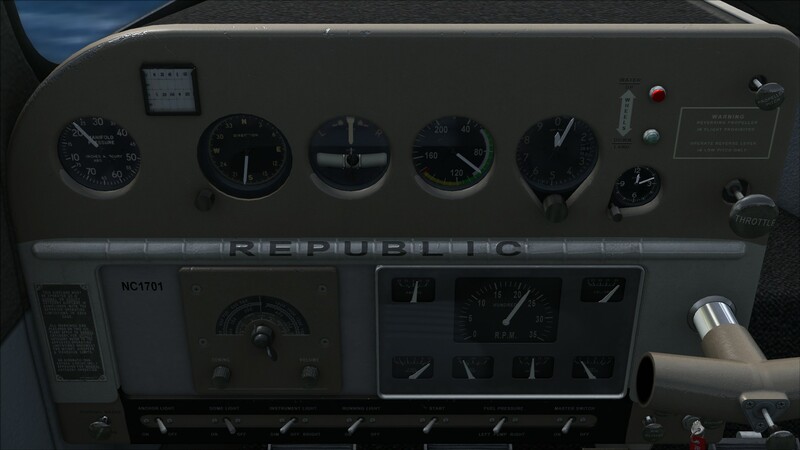 Some options, such as the variable pitch prop, make the aircraft modelled slightly more complex than that ideal, but better for us as modern simulator pilots. As mentioned earlier, not everything on the checklist is modelled and the first one of these that I noticed was that the magneto switch key is only animated to “off” and “both”, with “L” and “R” not selectable. As this isn’t an engine model where magneto failure is modelled anyway, that’s not a massive problem – just a little unexpected. 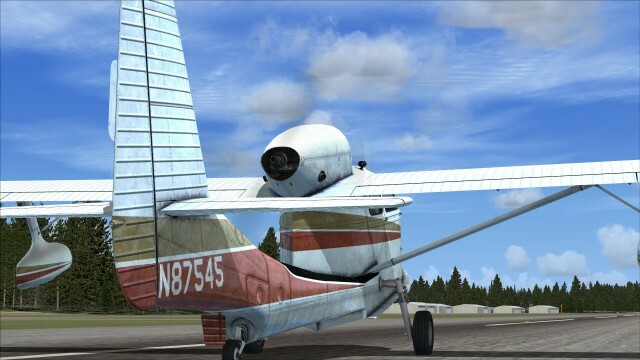 Flaps can be controlled by either using the default F5-F8 keys, joystick buttons, or within the VC by left or right clicking on the flaps handle and dragging. Left mouse button puts the flaps down, right mouse button up, and you’ll see the hand pump operate in sequence. One thing I did note, however, is that the visual and aerodynamic flap position animates considerably slower than the control movement in the VC. The pump handle stops a long time before the flaps are fully down or up. You’ll want to use flaps for takeoff, according to the manual and checklist, which simply say “down”, although intermediate settings are available. I found about 1/3 down to work well, but full worked as well. The aircraft danced a little on the rudder, which was quite difficult to balance (this continues through all phases of flight) but the tail lifts at around 50mph and the aircraft becomes airborne at about 55-60mph, climbing steadily away. 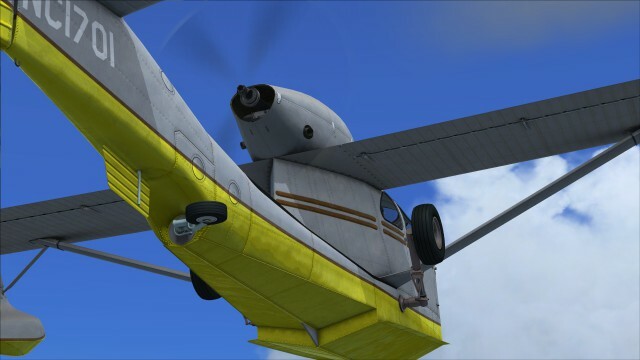 Make sure that you trim and balance the aircraft before looking down to retract the flaps, because it will pitch and roll, as I found to my cost when I first started flying it. You can’t actually see the flap control from the pilot’s seat standard viewpoint, so the co-pilot’s or between seat viewpoints are useful for this. What about the gear? Well, unless you’re flying to/from water, you might as well leave it down. It’s in the airflow anyway and its position makes next to no difference to aircraft performance, so just leave it where it is unless you have to. Looking at photos and videos on the internet while researching this review, it seems that cruising with the gear down is common practice. 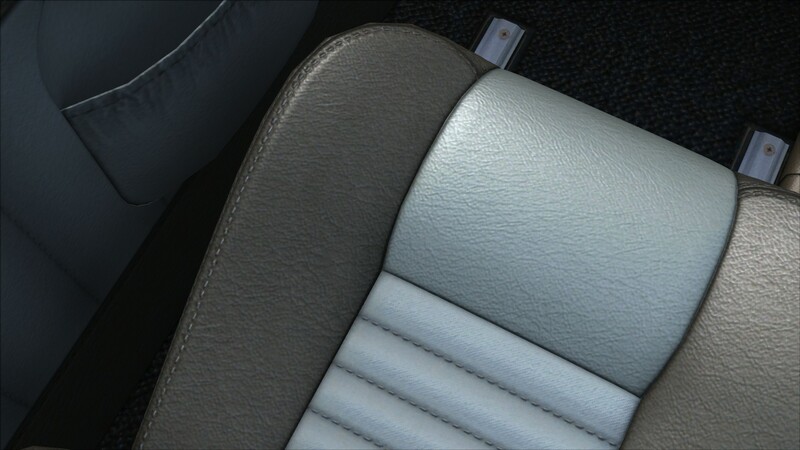 If you do need to retract it, you can either click on the gear lever and drag, or the manual pump handle and drag. It would possibly have been nicer to use the pump handle option for the flaps, as you can’t see those from the pilot’s viewpoint, but either option works and, unlike the flaps, the pump handle for the gear is much slower and moves apparently in time with the external animation. Being a variable pitch prop, you can theoretically adjust the cruise speed with the manifold pressure and prop pitch. Although three different sets of figures are given on the checklist for 75% power, I found that none of these were actually achievable; the prop rpm stayed too high, regardless of how far you pulled back the control, when MP above about 23″ was set. 22″MP and 2200rpm was possible, so was 23″ and 2300rpm, but 24.5″MP gave me a minimum of 2390rpm or thereabouts and 25″MP gave me a minimum of 2500rpm. Considering I was supposed to be cruising at 75% power at 24.5″MP and 2250rpm, for example, you can see that this just simply doesn’t happen. Using 24″/2400rpm gave me a cruise speed of around 105mph. The manual gives a 75% power cruise speed of 103mph, so that’s as close as I could get. At more sedate cruise settings, there’s a distinct tendency for the aircraft to gently and constantly yaw and roll to port, requiring constant attention. As you approach “normal” cruise though, or as close as you can get, this tendency pretty much evaporates. Prop pitch, when this image was taken, was set fully fine – i.e. feathered. Turning this rendition of the Seabee requires no, or next to no, rudder input at all. The moment you apply any, the slip ball will tell you to reduce it, but the aircraft seems to turn quite acceptably without any being applied anyway. It feels like there’s an auto-rudder in play and yes, I did check, autorudder is unticked in my aircraft realism options! 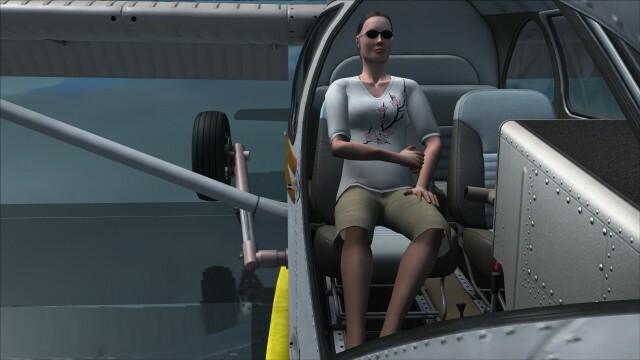 The aircraft is not aerobatic, so I didn’t try any beyond stalls and steep turns. Okay. That’s not true. I did barrel roll it once, but it wasn’t overly pretty, so forget I said that, right? Landing is pretty much straightforward. Reducing power reduced speed controllably, when combined with increasing elevator input, obviously, and 70-80mph approach speed is easily attained and retained, even with full flap deployed. The given landing speed is 58mph, which can be a little tricky; it does need you to retain a little power during the approach, as the stall, which happens at around the aforementioned 58mph, is accompanied by a very sharp nose drop. The landing gear is thankfully strong and can take a hard knock without breaking when you get it slightly wrong. It isn’t indestructable, though. Recovery from the stall is pretty much as you’d expect. There’s no wing drop or other nastiness, so break the stall, add power and slowly recover. I usually lose about 200′ in recovery, regardless of configuration. 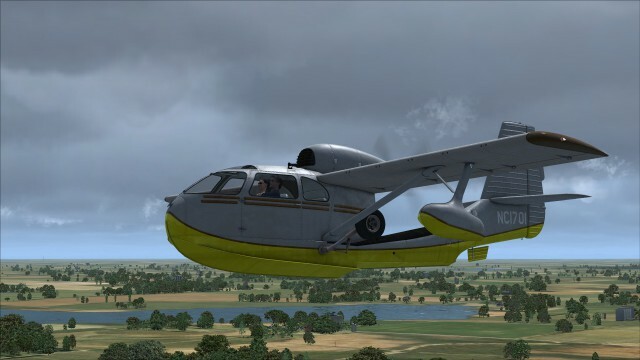 Being an amphibious flying boat, a large part of the appeal of this aircraft is obviously water-based operations. Thankfully, in this, they’re pretty easy. At least one of the videos I watched during research showed a very unconventional and inefficient takeoff procedure, where the tail was dragging in the water until the whole aircraft lifted. 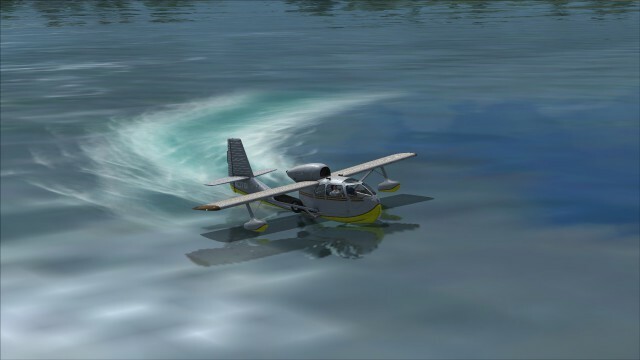 This is just show(flying)boating and if you follow a proper water takeoff procedure, you can get off very quickly: Hold back the stick until the aircraft rises, then push forward onto the step. 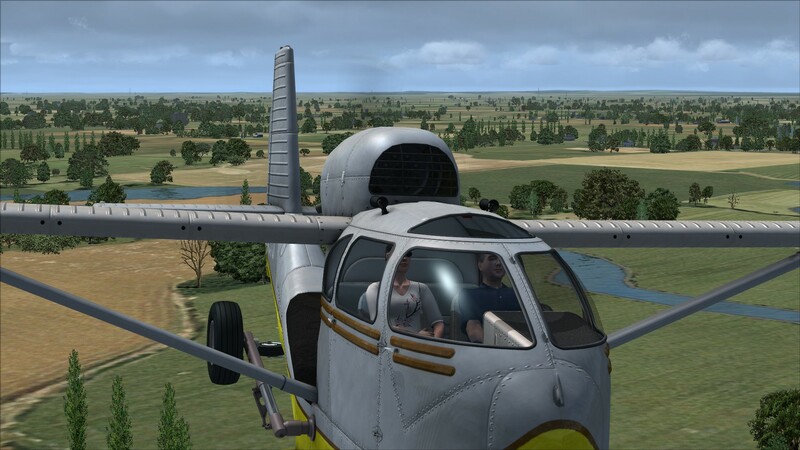 In the real world, you’d have to push forward again as the aircraft rises fully onto the step, but in FSX you can usually just ease off the pressure on the yoke and it will fly off. Take off and landing speeds for the Seabee are identical to land operations and procedures are pretty much the same. The only real difference is when getting out. On land, you have two side doors, but on water, you’ll probably get wet feet if you use them, as they are above the waterline, but not much. Thankfully, the starboard side of the nose opens, on shift-e-3, for when you are nosed into a shoreline or pier/jetty, allowing you to hop out. Surely that leaves you pointing nose-in and stuck there, though? Well, no. That’s where reversing the pitch of the prop comes in. 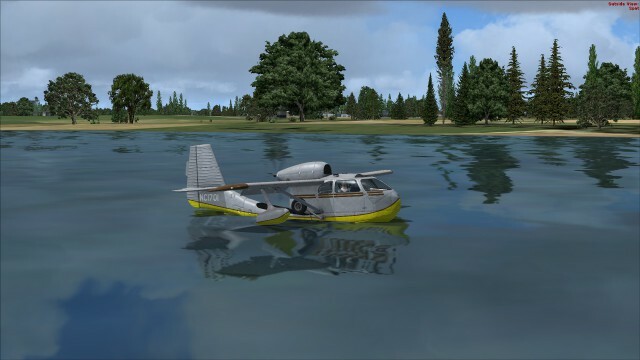 The single push prop can be altered, using the lever on the cabin roof and with pitch set fully fine, to pull instead and you can back away, using the effective and rudder pedal-operated water rudder to then taxi away for departure. Water taxying and step taxying are perfectly possible, although the latter involves a lot of foot juggling again. 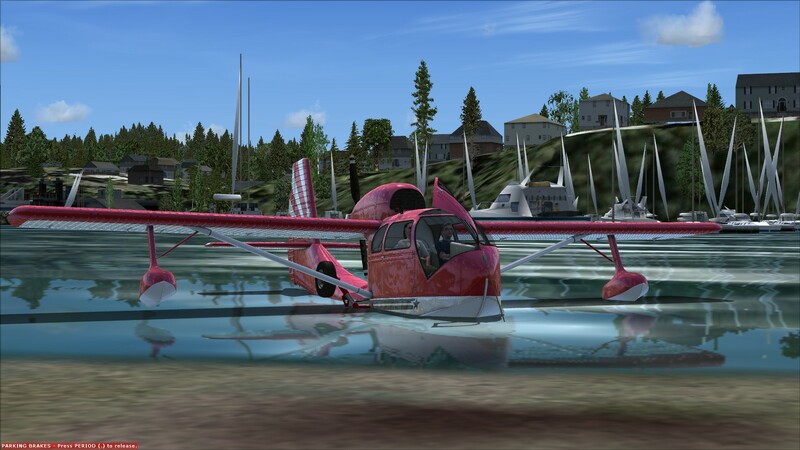 Beaching the Seabee has the same problem as any other amphibian has… FSX has no beaches. 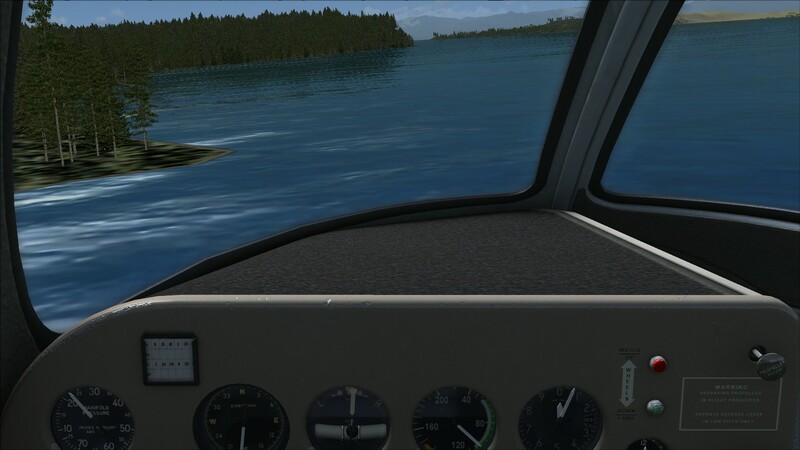 As a result, you will hop out onto land from the water as your aircraft reference point passes over the edge of the land polygon. The hop isn’t too big and the aircraft stays flat, so this is pretty easy to do, as long as you take it slowly. Finally, when shut down on water, with the gear up, putting the parking brake on will now deploy an anchor rope, rather than the tie downs and chocks you would see on land with gear down. The sound set that comes with this package is, compared to the videos I have found on the internet, pretty accurate. I have met a Seabee in real life, but it wasn’t running, unfortunately. It is fairly loud, as you aren’t wearing a modern noise-attenuating (and especially not noise cancelling) headset. I did have a few minor issues, which aren’t uncommon on my system, with sounds not being correctly reset when changing views. Tapping “Q” twice to turn sound off and back on always fixed these. There are no obvious loops, recording or amplification errors audible. To state a single overall rating again, the sounds are good. Not exceptional, but perfectly acceptable. It’s hard to come to a formal conclusion on this one, because while I really should be marking it down for the reversed VC controls, the other minor graphical errors and the inability to set correct cruise settings, the problem is that I love the little thing. 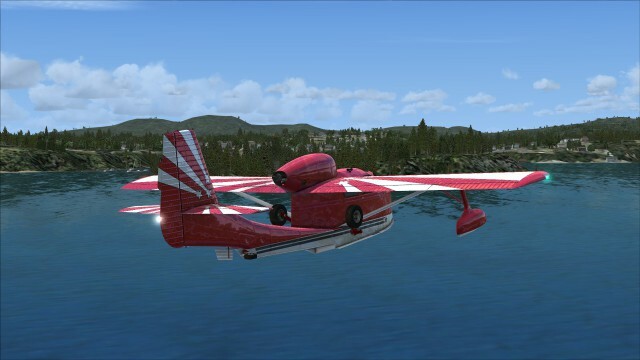 Buzzing around the Pacific Northwest, Scandanavia, Scotland or anywhere else with vaguely interesting scenery and water to land on, at low level, with superb visibility, is really good fun and mean that I, personally, can actually forgive the errors and really just enjoy flying the KCFS Seabee. Not everyone will be that lenient, though. Given that the model has been out quite a while, I’m surprised that the errors I found to be so obvious haven’t been seen and fixed, especially when the release for Steam has only recently happened. I will be passing them on to the developers, but will also be continuing to fly this unique little aircraft on a regular basis. 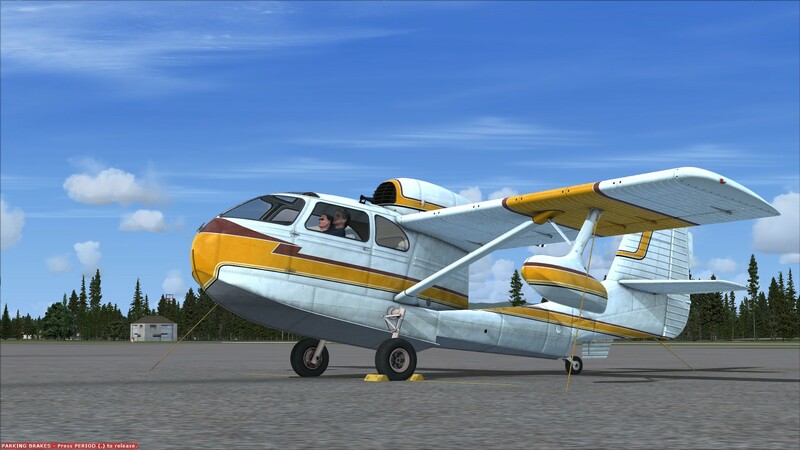 The Aerosoft published version of the KCFS Republic Seabee, which can be used on any version of FSX SP2/Accel, or Prepar3D, is available from simMarket, here, while the Steam DLC version, which can only be used with FSX Steam Edition and is the version reviewed, can be found here, at Steam. It’s just such a fun charming aircraft. I often use it for island hopping.